There is no teacher desk or chair in MEA member Colby Sharp’s fifth-grade classroom. 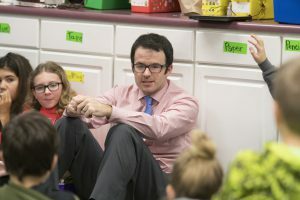 If the 11-year veteran educator is not moving around the room, consulting with students about what they’re reading or creating, he sits on the classroom rug and brings the kids to him. Sharp is on a mission. 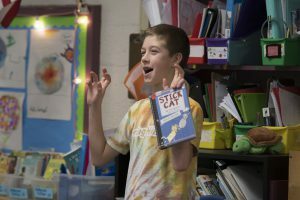 Students in Colby Sharp’s fifth-grade classroom read books of their choosing and do “book talks” to recommend titles to others who might like them. His boundless enthusiasm about books and creativity energizes his classroom and drives his literacy efforts beyond Parma Elementary School in Jackson County onto a dizzying array of platforms—work that has earned him a national reputation online and as a conference presenter. Sharp writes a blog about books, SharpRead; co-produces a podcast about children’s books, The Yarn, which is hosted by School Library Journal; serves as one of four moderators of the Nerdy Book Club, an online community of 20,000 educators and readers and 1,000 guest bloggers; and hosts a YouTube channel where he posts personal videos about reading and teaching. The summer nErDcamp he co-created six years ago now draws 1,400 educators from 40 states to attend workshops and hear from superstar children’s literature authors such as Newbery Medal winner Kate DiCamillo and RJ Palacio, whose novel Wonder was recently made into a movie. A companion nErDcamp Junior brings 1,000 students into the mix to meet their author idols and revel in the joy of writing. The event is free for adults and youngsters alike, thanks to facilities donated by Western School District where Sharp works, plus other donations and sponsorships. This July’s camp featuring Captain Underpants creator Dav Pilkey, among heavyweights slated to appear, filled up in 30 hours. Somehow the mega-event is organized by Sharp and three people in his circle: his wife, Alaina; Principal Sue Haney; and fellow teacher Suzanne Gibbs. Now Sharp is living the dream he loves to spark in children. 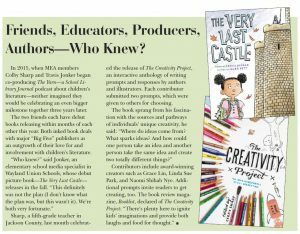 His book, The Creativity Project, was released in March by Little, Brown Books for Young Readers—one of the powerful “Big Five” publishing houses. The book, which he edited and contributed to, brings 43 authors and illustrators together in a creative challenge that invites the reader to participate. The experience of conceiving, selling, and publishing a book—which received multiple offers—didn’t seem real for a while, he said. MEA member Colby Sharp is nationally known for his work in literacy and student-centered teaching practices. Now his book on creativity has been published by Little, Brown Books for Young Readers. “I’ve spent so many years talking about everyone else’s books that it’s weird talking about a book that has my name on it,” he said. Sharp grew up one of seven siblings in a home spitting distance from the school where he now teaches, where his parents and youngest brothers—high school students—still live. His father, a truck driver, is an avid reader, he said. He started reading during breaks and lunches while working the third shift at a local Meijer store. The more he read, the more he loved it and the wider his array of reading material became. That experience informs his work today. Whether he’s teaching third, fourth, or fifth graders, he believes deeply in giving students choice in what they read and create. He carves time for students to read books of their own choosing and do book talks to share their recommendations. Sharp recently led a student to try a historical novel, The War that Saved my Life, and the 10-year-old girl could not put it down—reading 130 pages in one night. “This is the best book I’ve ever read,” she told him the next day. He knows what every student is reading, because he confers with each one. He learns their tastes and suggests books, and allows them to “abandon” selections they’re not enjoying. In addition, this year he’s beginning the day with “Creative Start,” 20 minutes for students to do what they choose “so long as they’re making something.” His students can’t get enough of writing, drawing, painting, producing videos and podcasts, creating video games, and more. That’s not to say Sharp and his students never read the same book at once or that he doesn’t teach lessons and give assignments—they do, and he does. But at the core of his philosophy is a desire to make learning exciting and memorable by tapping into students’ hearts and minds. For example, Sharp holds mock Caldecott Award elections with kids reading, evaluating and discussing nominees according to the award’s selection criteria. Then they watch a livestream of the actual Caldecott announcement and erupt in emotion at the news. Sharp has no assigned seats in his classroom. Students choose from a variety of options—a traditional desk and chair, pillows on the floor, tall standing desks, couches, and benches—and often shift and flow to different places at different times, depending on the task. “The (behavior) issues are a tenth of what I had when I was in charge of where they sat,” he said. Sharp knows he’s fortunate to work for a principal he calls “the best in the state,” one who doesn’t require him to use scripted curriculum, who values his ideas and passion and gives him freedom to do what’s best for kids’ learning and growth without dwelling on test scores. However, he credits the district where he spent his first six years for giving him the tools to evolve his practice—Battle Creek Lakeview, where instructional coaches were part of the staff. That same yearning for connection drives Sharp to build an ever-larger network of educators and readers who share his passion for learning as life and literacy as lifeblood.